Our unique method combines visual and acoustic training: each of the almost 2,000 words and phrases comes with a memorable illustration and is articulated by our professional speaker. 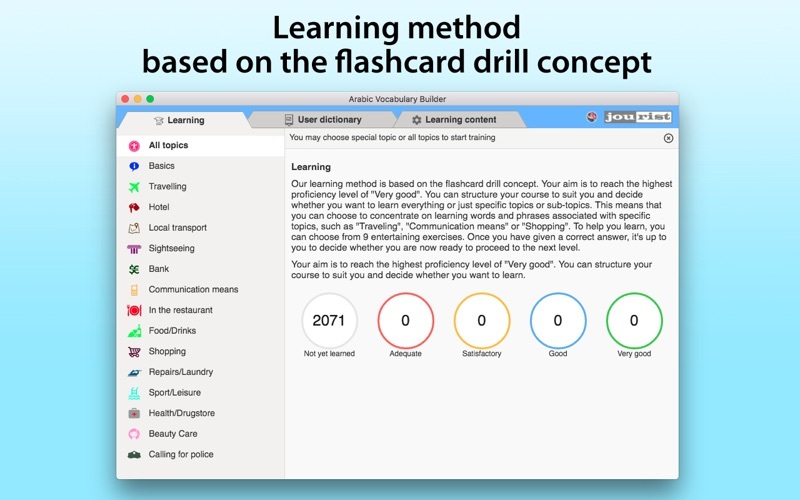 Our learning method is based on the flashcard drill concept. Your aim is to reach the highest proficiency level of "Very good". You can structure your course to suit you and decide whether you want to learn everything or just specific topics. You’re also able to create and edit your own dictionary with completely new images and sound files in order to expand vocabulary. This means that you can choose to concentrate on learning words and phrases associated with specific topics, such as "Traveling", "Communication means" or "Shopping". To help you learn, you can choose from 9 entertaining exercises. • More than 2,000 words and phrases illustrated and articulated. • You may use the following languages as a source for words and phrases: English, Chinese, Czech, Spanish, German, Italian, Hungarian, French, Portuguese (Brazil), Russian, Polish, Persian and Turkish. 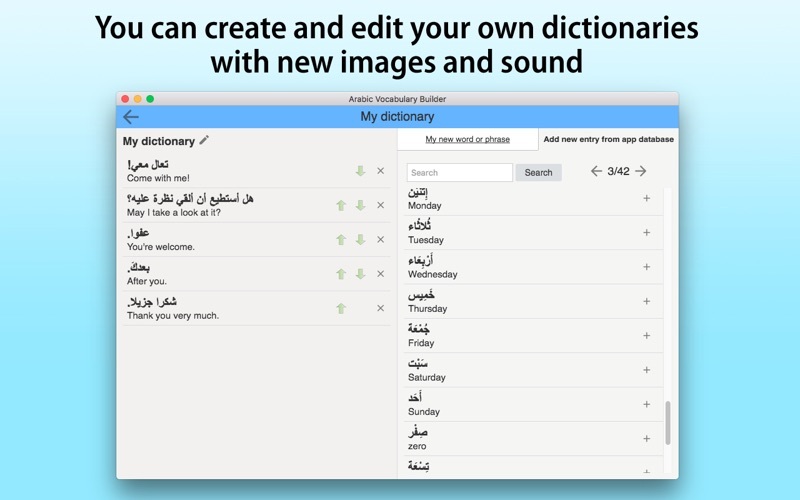 • You can create and edit your own dictionaries with completely new images and sound files in order to expand vocabulary. • You decide what you want to learn. • All phases are articulated by native speakers. • Each word and phrase is illustrated, making them even easier to memorize. • Choose from 9 different types of entertaining exercises for enhancing your vocabulary training. 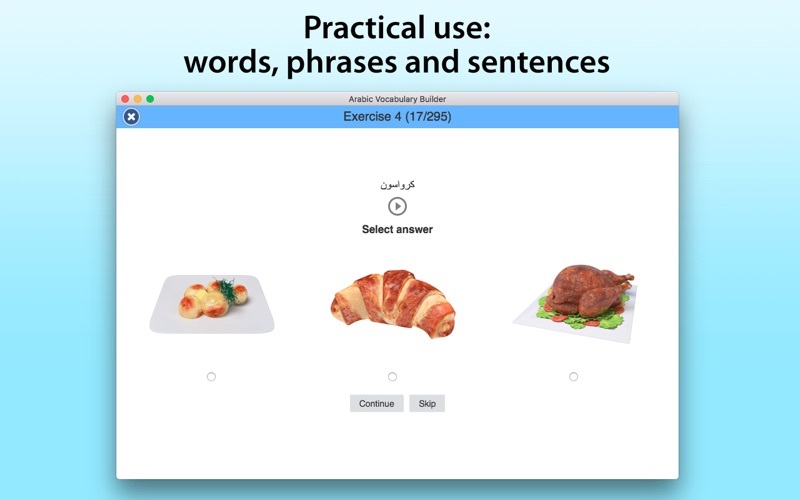 • Exercise to promote audio-visual memorization of words and phrases: alongside the audio recording and the visual image, you see the word or phrase written in both your native language and the foreign language. • Concise and logical division of content into topics.